67-year-old retired engineer, Aleksander Doba, arrived in Port Canaveral, FL, last night, Thurs., 17 April, after crossing from Portugal. 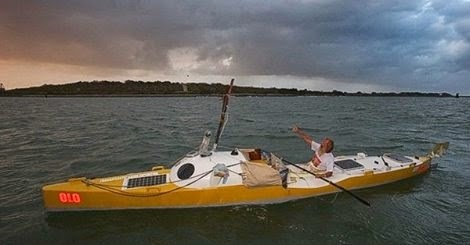 He continued today through the Canaveral Barge Canal to the ICW, and will complete his trip when he arrives in New Smyrna Beach in a couple days. If you have not been following this, there has been substantial writing on his trip. These may be found on Facebook by searching for Expedition Canoeing & Kayaking.